Particle and Surface Sciences are pleased to announce the release of the Micromeritics AccuPyc II 1340 1-cm3 Gas Displacement Pycnometer. The Accupyc 1340 features improvements in design that allow the volume of small amounts of sample to be accurately detected and measured with enhanced reliability to within a fraction of a microliter. The 1340 has superseded the Accupyc 1330 Pycnometer. 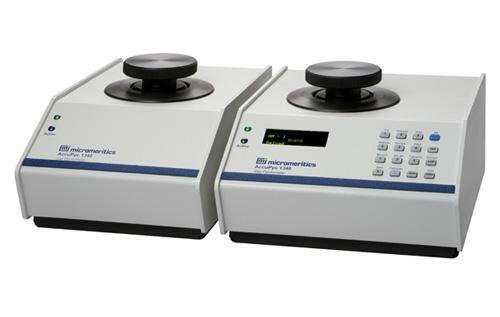 For those who have a need to analyze a very limited amount of material, Micromeritics’ new AccuPyc II 1340 1-cm3 Gas Displacement Pycnometer performs fully automatic, high-speed, high-precision volume measurements and density calculations on a wide variety of powders and solids. The AccuPyc features improvements in design that allow the volume of small amounts of sample to be accurately detected and measured with enhanced reliability to within a fraction of a microliter. A novel manifold design utilizes high-reliability, high-precision valves that seal more securely so that small leaks do not contribute to variability of results. High-compression, minimum-volume seals around the pressure transducer minimize helium storage and leakage. This shortens the time to complete a run cycle and practically eliminates the development of temperature gradients that would otherwise compromise results. The AccuPyc II 1340 1-cm3 also features an ultra-low noise transducer amplifier that results in faster equilibration. The instrument can be operated with a keypad or an optional Windows® interface that provides exceptional reporting and archiving capability. Both versions include direct sample mass input from a balance and cycle-based displacement volume reporting. The Windows interface also includes time-based pressure equilibration, percent solids content, and total pore volume reports. For those who require high throughput, an integrated control and analysis module can control up to five additional external analysis modules of the same or different volume capacities. A glove box model is also available for analyses in applications where the control module and analysis module must be in separate environments.